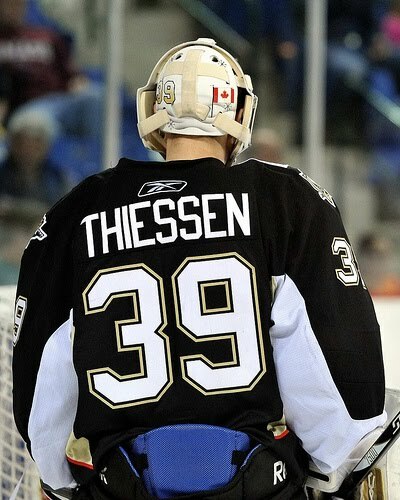 Here is Pens Universe's latest interview with Wilkes Barre Scranton Penguin netminder Brad Thiessen. Again, great job to all our readers whom submitted some questions! BT: My favorite team growing up was always the Vancouver Canucks, I remember being pretty devastated when they lost in game 7 of the finals to the Rangers in 94. 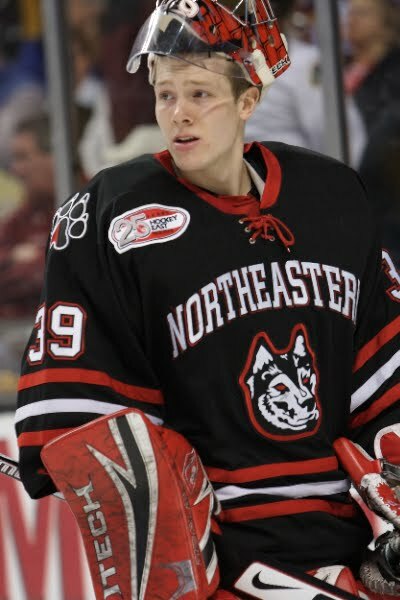 My favorite player was Felix "the cat" Potvin. I liked him when he was the Leafs and after he went to the Islanders he was traded to Vancouver which made me pretty happy, I have his Canucks jersey. PU: Why did you choose the sport of hockey? BT: In Canada that's just pretty much what you grow up with. I also really enjoyed playing baseball but as I got older with all the training and everything year round it turned into hockey all the time. PU: Do you consider yourself to be superstitious in any way? BT: I don't think I would say I am superstitious but I do like to follow certain routines on the day of the game and before a game so if you consider following the same pattern superstitious then I guess I am! PU: What helped influence your decision to leave Northeastern after your junior year and sign with the Penguins? BT: I think it was just the fact that I wanted to move on to the next level and the next challenge in my hockey career. My goal has always been to play in the NHL and my college career helped me along that path and the opportunity to sign with the Penguins was too good to pass up. PU: What is it like to go from bouncing between Wheeling and Wilkes-Barre in the beginning of the season to now being the go-to goalie in Wilkes Barre? BT: It wasn't easy at the beginning of the year that's for sure. From not playing very often here in Wilkes Barre to being sent down to Wheeling it was a little bit frustrating at first but it gave me the opportunity to play more games. Then when I was called back up and was given more time to play I was probably more prepared which was a good thing. PU: What does “being focused” mean for you? During the day of a game, does it mean thinking about the game or not thinking about the game? BT: Being focused for me means trying to be relaxed, not over thinking about the game because I think that can get you in trouble sometimes, you spend too much of your energy thinking instead of just being relaxed and playing hockey. I am not a goalie that sticks to themselves before a game and not talk to anyone, I like to be relaxed and try to have fun. PU: Have you ever gone out on the ice and felt unprepared? Maybe the day didn’t go right and you’re not as prepared as you’d like to be? BT: Definitely there are times when you go on the ice and you just don't feel right or you don't feel prepared. You are not going to be at your best every single night as much as you would like to be. Those are the games that you just have to battle and try your best to not think about it and help your team win. PU: Is there a trick to shaking off a bad goal? BT: There is no trick per say it's all about your mindset and trying to put it behind you. It's not that easy to do, when you let in a bad goal you feel as though you let the team down and you want to make it up but you have to focus on the next shot because that is what helps make a good goaltender, having a short memory. PU: Why the number 39? BT: Pretty much I just liked the way it looked. 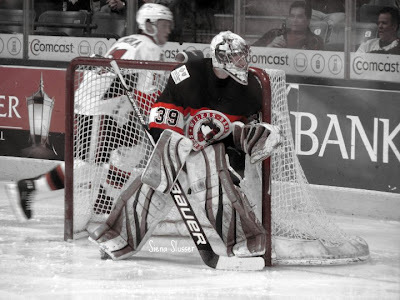 I am not a Dominik Hasek fan so it wasn't because of that although I did like Cristobal Huet when he wore 39 so that has something to do with it. I only started wearing it at college after I had asked to wear 33 but it was already taken. PU: Do you have a favorite moment that sticks in your mind since you've turned pro? 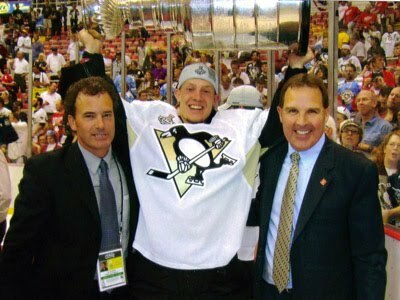 BT: Well it definitely would have to be being along for the ride last year when Pittsburgh won the Stanley Cup. That was an experience that I will never forget. As for this year I think just the way we were able to go on a pretty good run to clinch a playoff spot after we had a pretty tough stretch in January and things weren't looking so good. We came together as a team and the past 2 months were a lot of fun. 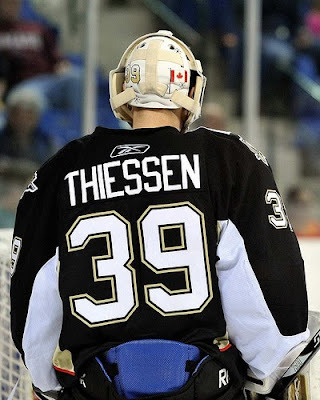 PU: On February 13, 2010 you held Hershey, the best team in the league, to a 5-0 shutout. What went through your head as the final minutes ticked off the clock and the final horn sounded and you were mobbed by your teammates? BT: That was kind of the start of when we turned our season around so to win that game 5-0 against Hershey was a important game. For me over the last minute I was pretty excited because it was my first shutout in the American Hockey League and to do it against Hershey and at home was special, the crowd always is a little louder for those games so it was a lot of fun. Thanks Brad for taking out the time! Good Luck to the Wilkes Barre Scranton Penguins as the take on the Albany River Rats in their first round of playoff action!